We're celebrating the launch of our New Blush range. 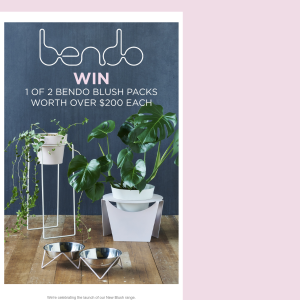 WIN 1 of 2 BLUSH packs worth over $200 each. Each pack contains a Tall Plant Stand & Pot and our Double Dog Bowl. *Sheet metal plant stand not included. Competition closes midnight December 9, 2018. Eligible to Australian residents only.